Put away those rolling pins and muffin tins. Enjoy blueberries, cashews and dates with a dash of lemon and vanilla in a bar. Soft and chewy with a hint of crunch, this blueberry bar is less than 200 calories. Ingredients: Dates, Cashews, Blueberries, Blueberry Juice Concentrate, Lemon Juice Concentrate and Vanilla Extract. Great taste and glad to see it here, as stores don't always stock it. Wish it were organic too. This is my favourite flavour of Larabar. Hard to find it in stores. So glad Well.ca carries it. 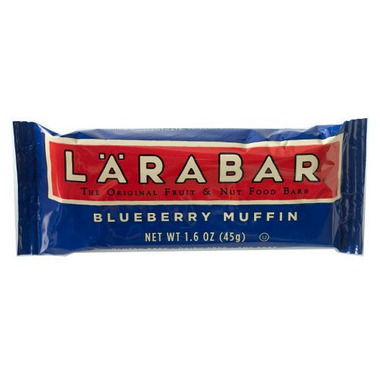 I love Larabars, but the blueberry flavour is lacking a little something. I don't find it as nutty and filling as the peanut butter kinds.